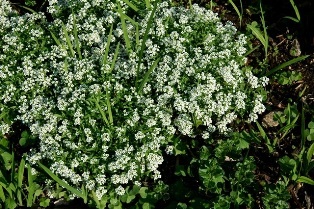 HABIT: Low growing, small delicate flowers of white and lavender which bloom in summer. Native to Turkey. CULTURE: Requires little care but is damaged easily by foot traffic and pets. Any soil, relatively drought tolerant. Likes cool weather. USES: Rock gardens, pockets in stone walls, small accent areas of annual color.